How do I claim a Deal with my Phone? Can I use my Laptop to claim a Deal? The Firefox, Google Chrome, and Safari web browsers typically support Facebook Deals, while Internet Explorer often does not. You must select "Allow" if a pop up asks if you wish to share your location as it must verify you are at Bloomington Cleaners in order to Check In. How do I use Facebook Deals? After Checking In, present your Claimed Deal screen to our staff and they will let you know if there are any additional restrictions or limitations. What if I have problems Checking In? 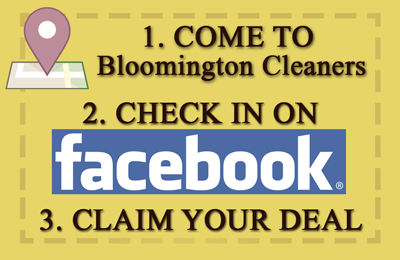 *Some restrictions may apply to Facebook Deals offered at Bloomington Cleaners; see your server for details on your deal.